Crimean Tatars fear Russia’s newest invasion: From Catherine the Great to Vladimir Putin. Crimea’s Tatars have lived in the shadow of the Russian empire for centuries, and once again have the most to lose. 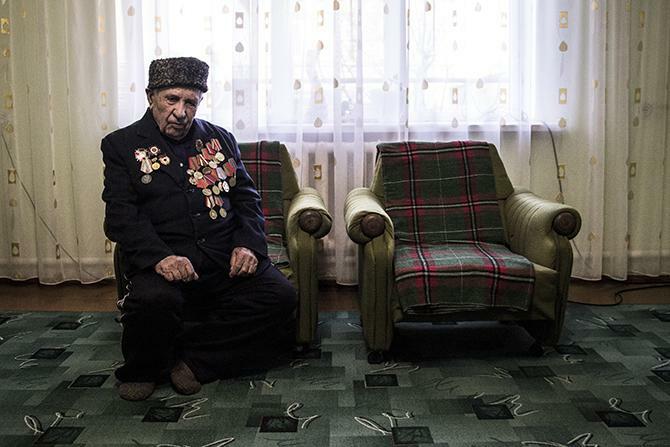 Ufeyn Fakhreev, a 91 year-old Crimean Tatar, has lived through Lenin, Stalin, World War II, forced exile, and the Soviet collapse. 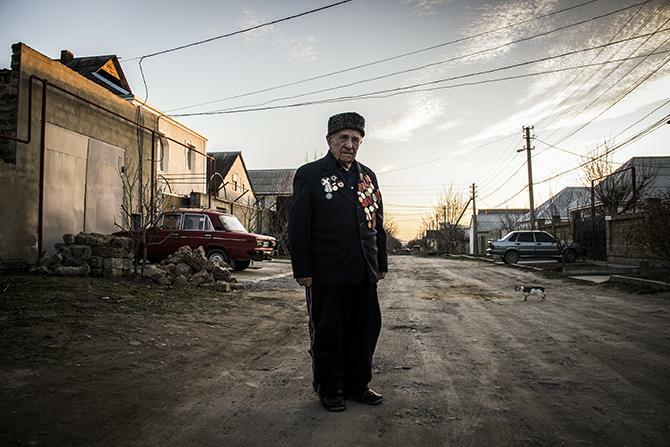 KAMENKA, Ukraine—Ufeyn Fakhreev’s hands bear the scars of Soviet-era exile. His hands love to caress the table in the home he built after returning to his native Crimea. And his hands shake when talk turns to Ukraine’s current predicament. When Ufeyn was born, Lenin was still alive. He climbed wild cherry trees during the days of Stalin’s collectivization. Ufeyn lost half of his right middle finger on the frontlines of World War II. On Monday, as Russian soldiers surround Ukrainian military bases in Crimea, reportedly demanding immediate surrender, the pre-quake tremors of war spread across the Black Sea peninsula. Ukraine’s acting President Oleksandr Turchynov called the incursion a “provocation,” and Western leaders have been scrambling desperately for a response to the crisis. 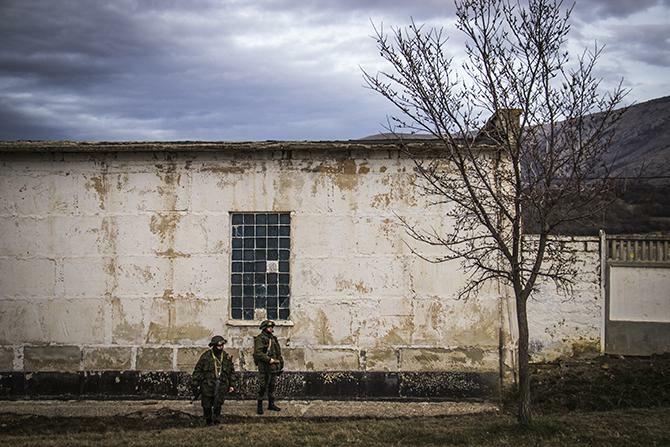 Unidentified soldiers, widely suspected to be Russian, have seized and surrounded strategic points throughout the Black Sea Peninsula, including this Ukrainian military base at Perevalnoye. Perhaps no one has more to fear in this potential conflict than Crimean Tatars like Ufeyn. The Crimean Tatars are one of the world’s ill-fated nationalities whose history is punctuated with seemingly cyclical episodes of subjugation and displacement. A Muslim ethnic minority with ancestral roots in Crimea dating back before the Russian czars, the Tatars consider themselves one of the peninsula’s indigenous people, descending from an indecipherable blend of Greeks, Jews, Franks, Armenians, Italians, Turks, and Mongols. In the mid-14th century they formed an independent Khanate from the ashes of the Golden Horde, living in relative peace until Catherine the Great annexed Crimea in the 1780s. After the Communists came to power, the Tatars suffered severe depredations, with half their population displaced or killed by the time World War II began. During the war, a handful of Tatars supposedly collaborated with the Nazis, giving Stalin reason enough to deport the entire Tatar community to the Gulag and Central Asia in 1944. Only with perestroika and the Soviet Union’s eventual collapse could the Tatars begin their slow march home. Now, the Tatars make up 12 percent of the Crimean population as of the last Ukrainian census, and most live in small villages built by resettled migrants. Though ethnic strife with the surrounding Russians has been minimal until recently, the Crimean Tatars have little interest in returning to life under the Russian yoke. In the Crimean capital of Simferopol, ethnic Russians have been the dominant presence on the streets since the crisis began. They camp out under the Russian tricolor flag and chant “Russia, Russia, Russia!” While most of the pro-Russian protestors insist that interethnic relations have been peaceful in Crimea (and they’re mostly right), they ignore the extent to which the Tatars abhor the Russian government. 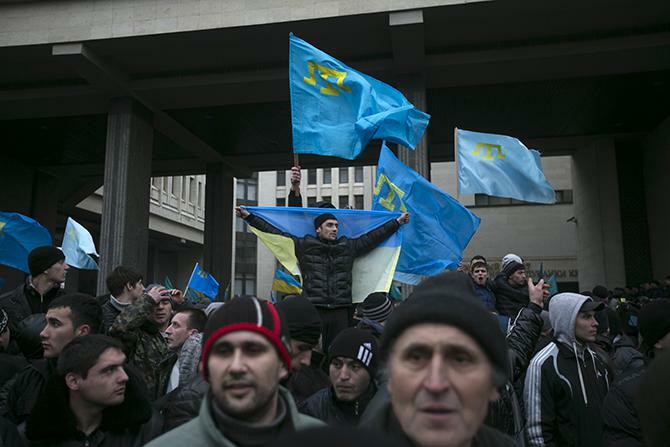 Crimean Tatars hold flags during rallies near the Crimean parliament building in Simferopol February 26, 2014. Last week, on Feb. 26, tensions spilled over into fierce clashes between Tatars and Russians outside the Crimean parliament. The melee ended with several injuries, a reminder of how easily this carefully orchestrated political theater can slip into violence. To find the Tatar communities you have to drive along one of the four main roads that lead out of Simferopol, scanning for the minaret of a mosque poking out above the low-roofed countryside homes. Along the P-23 highway outside the village of Kamenka, scores of women and children gathered on Monday for an anti-war rally. They spoke out in favor of the Maidan, the opposition government, and a Ukrainian Crimea; they called Putin a “dictator,” “maniac,” and “tyrant.” Many could not contain their terror. Women and children, mostly ethnic Tatars, gathered for an anti-war rally near the Crimean capital of Simferopol on Monday. I met two of Ufeyn’s daughters, Eminye and Taire Fakhreeva, amid this crowd. Wearing nearly identical purple sweaters, they seemed shocked to be standing there needing to protest for peace. They never imagined they’d have to fend off Russia yet again. 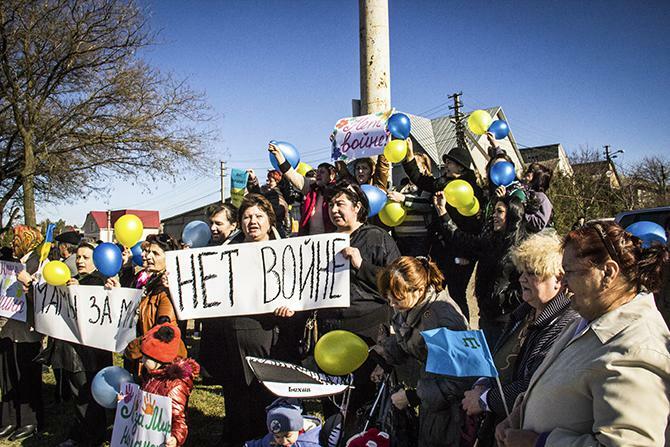 For the Fakhreevs, like many Tatars, Crimea was just starting to feel like home again. “I never thought this could happen,” Ufeyn Fakhreev says of Ukraine’s currently unfolding crisis. The Fakhreevs’ home stands on a dirt road in Kamenka, tucked off the highway just minutes from where the anti-war rally took place. Spacious, with a long entry hall and cavernous living room, it currently houses nine family members, spanning three generations. As we sat around the Fakhreevs’ table, sipping tea and eating dried fruit, Ufeyn built a small pyramid of date pits. He rubbed his hands together slowly, as if making sure that after all these years, they’re still there.